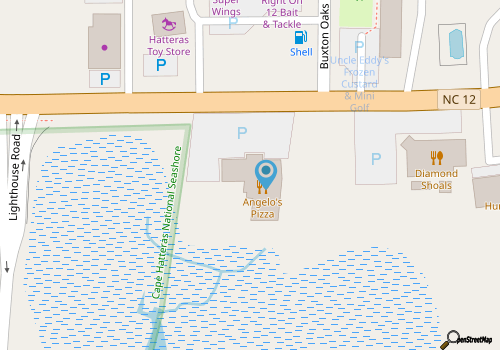 Angelo's offers food and recreation under one roof. The Buxton Italian eatery has a varied menu. friendly staff and is open for lunch and dinner. Enter a spacious restaurant with comfy chrome and red padded chairs, red and white check floor, red booths and tables, tin walls and vintage black and white photographs. The huge arcade has at least 25 games to play as well as pool tables. You can eat in the dining or recreation area. All tastes will be satisfied by their eclectic menu that features Italian and American food. Order pizza, subs, spaghetti, lasagna, calzones, manicotti, and veal, chicken or eggplant parmeson. Dive into an antipasto salad or nibble on cheese sticks, jalapeno poppers, calamari, hot wings, chicken fingers, fried cauliflower or bread sticks. They even offer seafood - crabcakes and clam strips plus lighter fare including hot dogs, burgers, wraps, salads and sandwiches. Beverages include coffe, ice tea and Coke and Pepsi products. Enjoy the convenience of a fresh produce stand out front in season. Angelo's is open year round from 11 a.m. until...!. Call 252-995-6364 for current hours.